My grandfather, Frederick Hawkins, signed up to the Second London Field Ambulance during World War One because he wanted to do his part, but not to fight. 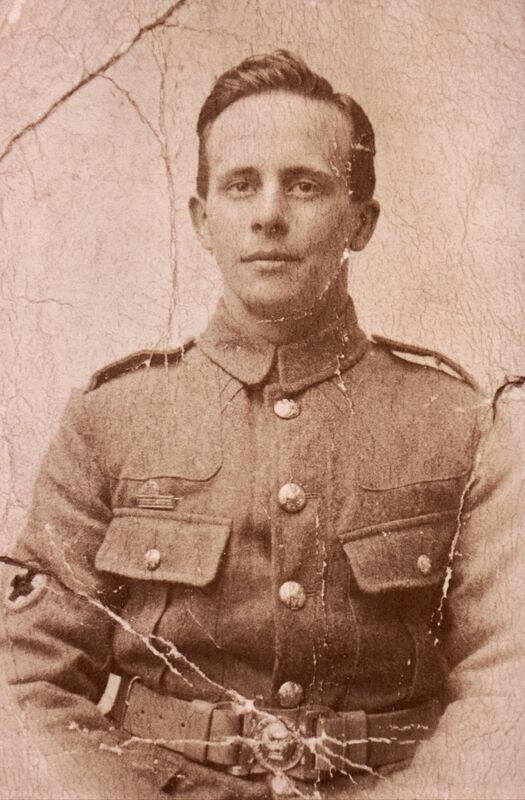 He became a stretcher bearer and served in Northern France between 1916-18, assisting at many of the worst and most bloody battles including the Somme and Ypres. Stretcher bearers are the unsung heroes of that disastrous war. They saw more death and damage to human flesh than probably anyone else, literally wading through it day after day to collect and carry back the wounded from No Man’s Land. It was heavy physical work, taking sometimes eight bearers to a single stretcher, in testing conditions. With no weapons to protect themselves, they were exposed to constant danger from shelling, lung damage from poison gas (my grandfather had to spend time in a sanatorium after the war), not to mention the soul-destroying work of trying to keep a wounded man alive long enough to get him to where he could receive proper treatment, sometimes carrying him for hours over impossibly rough and treacherous ground only to find that he had died from his wounds. Other soldiers looked down on the stretcher bearers, calling them cowardly for not fighting. Very few were decorated despite their many acts of bravery, and for a long time their contribution was forgotten, even when that of the nurses, ambulance drivers and other medical personnel began to receive (well-deserved) attention. But without the bearers, the first link in the well-organised ‘chain of evacuation’ of wounded from the battlefield, many fewer men would have survived. The irony, of course, is that the Field Ambulance’s objective was to restore as many soldiers as possible to fighting fitness, so that they could be sent back into battle. It was an efficient management of resources, as much as a humanitarian service. Emily Mayhew’s Wounded, a marvellous and immensely readable story of all the medical personnel involved in World War One , brings to life the difficult and dangerous work of the bearers, and their indomitable spirit. She includes this moving poem written by padre Geoffrey Anketell Studdert Kennedy, composed from all the things a bearer might have said to one of his charges in order to keep up morale as they made the tortuous journey back to safety. The last two lines are very poignant. Lift ‘im up a little ‘igher. Want to rest ‘ere for a while? There ye are, lad. That’s the style. ‘Ow’s that, chummy? That’s the tack! But ‘e might just start to shell. Are ye right, mate? Off we goes then. Gawd Almighty, that’s a near ‘un! Mind this rotten bit o’ board. ‘Opes ye gets to my old ward. What’ll stop that blarsted pain. Makes it rotten for the lad. It affec’s ‘im twice as bad. ‘Ow’s it goin’ now then, sonny? Lawd Almighty, what a stench! Bring him aht a cup o’ tea! Ye have done it unto Me. Tags: Emily Mayhew, Geoffrey Anketell Studdert Kennedy, Remembrance, Second London Field Ambulance, Somme, stretcher bearer, World War One, Wounded, Ypres | Permalink.